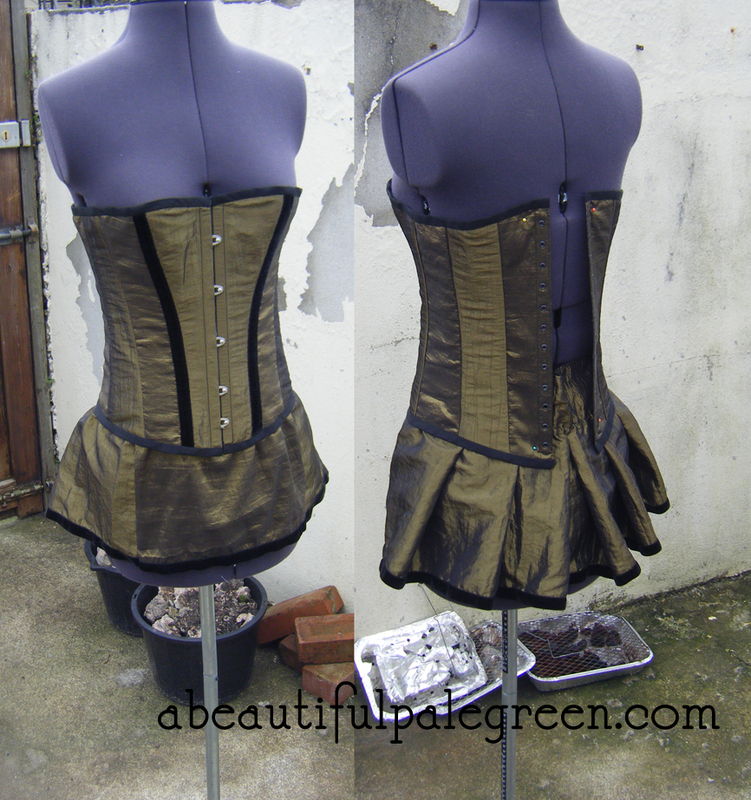 Firstly, I loved that last corset so much, that I made another one, this time with a matching skirt! It’s a custom order, and I can’t wait to see it being worn! I think it’ll look amazing! It’s a shot polyester taffeta, and the shot aspect means that it looks different depending on what angle its at. With that in mind, I cut the alternating panels perpendicular to each other, which is what gives it the stripey look particularly evident in the right hand image. I’ve also invented a new way of making single layer corsets: You’ll notice the lack of visible stitching, and yet it’s a fully lined and reinforced corset, which is quicker and easier to make than normal! This is due to magic. To go with it, I’ve also been working on a mask, which I’m pretty happy with. I’ll post some pictures when it’s all finished! I also thought I’d give you a taste of how the site redesign is going to look, when that goes ahead! Here is a picture! This is being made by a friend of mine, who’s blog you can find just over here, although it’s more about model making and less about graphic design. That’s about it for now! I’ve got a bunch of orders on the go, so I’m super busy! This entry was posted on Wednesday, October 10th, 2012 at 12:46 pm	and is filed under clothing, corset. You can follow any responses to this entry through the RSS 2.0 feed. You can leave a response, or trackback from your own site.